Restores lustre and colour to old and faded bodywork. Removes oxidised and weathered surfaces plus petrol and derv stains from paintwork. Polishes to a deep shine and is effective on all colours. Formulated for all motor vehicle finishes including: acrylics, synthetics and cellulose. Contains silicones. For the removal of oxidised and weathered surfaces. 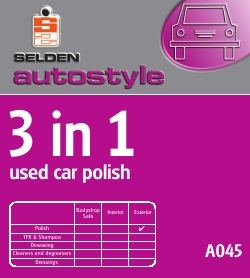 Ideal for renovating used cars with faded paintwork. Polishes effortlessly to a deep shine. The vehicle should be clean and dust free. Shake container before use. Apply polish with a soft lint free cloth. Allow to dry. Polish off with a clean cloth. Always replace cap. STORAGE: Do not store in temperatures greater than 35°C. or less than 0°C. Store away from foodstuffs. Do not transfer into another container. SPILLAGE: Contain spillage and soak up in absorbent non-flammable material such as sand or earth. Keep out of the reach of children. Composition A blend of water, solvents, silicones, waxes, and minerals in an emulsion form.